An awed hush fell across the room Wednesday night as a girl perched upon the grand piano, took a deep breath and began to sing. Her music flowed across the audience in Aalfs Auditorium like a soft wave coming across the shore. All eyes were riveted to the fearless performer, Jeanna Kellogg, as she told her story through resonating notes and an unforgettable voice. The crowd erupted into a dull roar of a standing ovation as the final chords of her song faded into the night. As Michael Roche said in his speech early Tuesday morning, “What have you done with your gifts?” The 2018 Girls State members took University of South Dakota Criminal Justice Professor Michael Roche’s message in stride, proving they are all blessed with much more than just leadership qualities. 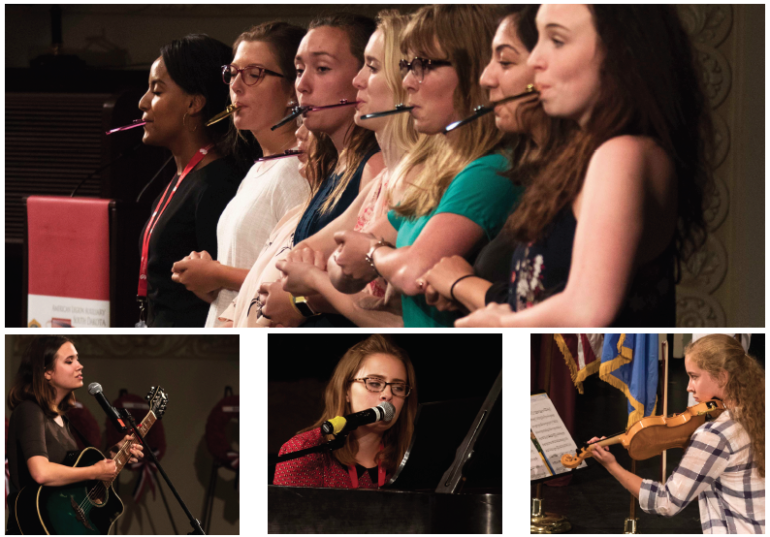 As the annual Girls State Talent Show commenced, Slagle Hall filled with the resounding echoes of singing voices, the tickling of the piano ivories and the immense feelings of laughter and fun. The joyous cheers and screams of an exuberant crowd of more than 300 delegates followed each and every performance. The very first performance in particular had the crowd laughing until their sides hurt. The junior counselors performed a skit entitled, “Girls State: A Greek Tragedy,” which featured the struggles delegates face throughout the week. This included losing water bottles, waking up too early for comfort, falling asleep during assemblies and the over-sensitivity of blistering feet. Their comic skit was inspired by the Shakespearean play “Othello” and “was the product of all our personalities,” said junior counselor Eda Uzunlar. The performance consisted of eight acts, each one more funny than the last. The counselors were not the only ones with outstanding performances. Maria Moriarty, from Miami, beautifully played a difficult violin solo. With a grin on her face, she said that she had never performed the solo in front of an audience before and how cool the experience was for her. “I’m pretty pumped,” said Moriarty. The Girls State Talent Show has been around since the creation of Girls State in 1946. As Hovorka said, there has never been a Girls State without an opportunity to share gifts and talents every delegate possesses. Rising above the many nerves and fears that come with performing in front of a large crowd, the contestants performed with the heart, soul, and unending talent that the Girls State program thrives on.